When Lawrence Rogers was fighting overseas during the First World War, he exchanged hundreds of letters with his wife and family back home in Valcartier, Quebec. As the war progressed, his 10-year-old daughter Aileen decided that her dad needed some extra comfort and protection and so she sent her beloved stuffed bear "Teddy." Teddy remained by Lawrence's side until he was killed at the Battle of Passchendaele on October 30, 1917. In 2002 Lawrence’s granddaughter, Roberta Rogers Innes, found Teddy and the family's letters in a large suitcase. Teddy's poignant story of courage, comfort, and tragedy garnered national attention and has come to represent the loss experienced by thousands of ordinary Canadian families. 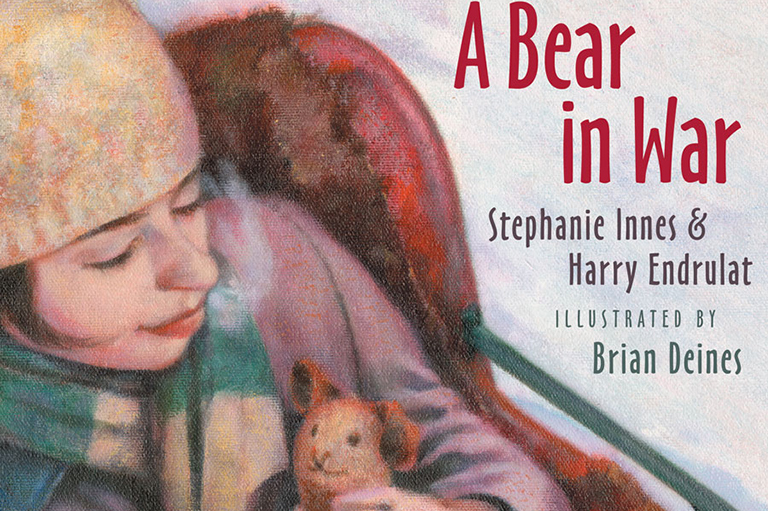 A Bear in War by Stephanie Innes (Roberta’s daughter) and Harry Endrulat share Teddy’s remarkable story–from his life in East Farnham, Quebec, and his voyage overseas to his eventual journey home. Each chapter in Teddy’s tale is brought to life through Brian Deines’ illustrations. Today, Teddy resides in a glass display case at the Canadian War Museum. This book serves as a gentle introduction to war, to Remembrance Day, and to the honour of those who have served their countries. At the 5th Canada’s History Forum, historian Kristine Alexander discussed her research that focuses on the exchange of letters between children and their fathers during wartime, and she included the story of Teddy in her talk. The award-winning National Film Board of Canada has a number of suggestions and resources for teachers wishing to show their films in the classroom.